Looking for a place to see some Kamloops wildlife this summer? 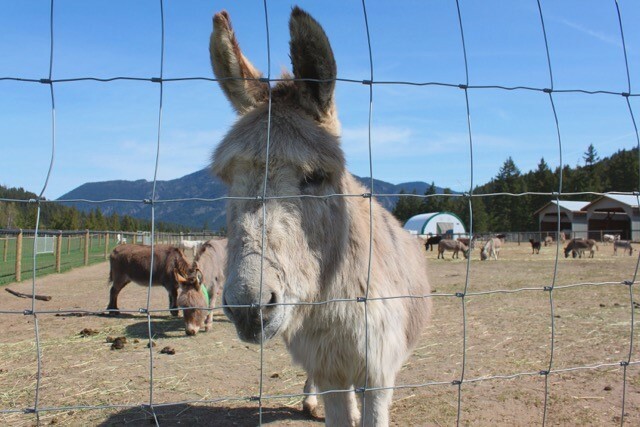 The British Columbia Wildlife Park and Turtle Valley Donkey Refuge are two great places for families, children, and animal lovers to get their fix on several interesting animals native to British Columbia. The British Columbia Wildlife Park houses several different species of BC wildlife for rehabilitation, research, and breeding located just 15 minutes east of Kamloops along the Trans-Canada Highway. The 50 hectare park is home to everything from big cats, birds, bears, canines, small animals, hoof stock, to reptiles and amphibians. Their mission at the BC Wildlife Park is to encourage the appreciation of and respect for BC’s wildlife and to assist in preserving biodiversity through education, research, captive breeding, and rehabilitation services. The BC Wildlife Park’s goal is to connect people to BC’s wildlife and wild places in order to encourage a sustainable society. I visited the wildlife park on a hot afternoon in April and was instantly impressed by the look and feel of the services and buildings offered by the park. The staff were helpful, kind, and my visit was self-directed which let me do my own thing around the park. The first thing you notice is the wide-open, grassy spaces, dotted with trees that look ideal for an afternoon picnic. My favourite part was actually the Home Hardware barn where farm animals and smaller live stock are kept. The goats would prop themselves up to eat out of hay baskets hanging from the ceiling. You could pet and take pictures of the animals. The birds of prey were mesmerizing and beautiful. I was glad to see the animals were getting the proper attention they needed after being injured in various accidents. I enjoyed the hike at the end and took some great waterfall pictures. For more information about the BC Wildlife Park concerning directions, rates, and hours, check out their website at http://www.bcwildlife.org or give them a phone call at (250) 573-3242. The Turtle Valley Donkey refuge is a beautiful farm to visit this summer for families, children, and animal lovers. The refuge, located just outside of Chase, BC, is run by founders Rob Miller and Shirley Mainprize who devote their time to caring for senior, neglected, and abused donkeys. The refuge began 19 years ago when the two developed a passion for the animal and wanted to create a space for neglected donkeys. The Donkey Refuge is now owned by the Turtle Valley Donkey Refuge society but the original founders still volunteer daily on the farm. As donkeys can live up to 50 years, many are abandoned by owners who were not aware or prepared for the commitment. Donkeys are often not taken care of properly due to the unique care they require. Donkeys are native to South Africa, and the BC climate and topography allow for numerous health issues to pop up if the animals are not taken care of properly. Dental and hoof care are the most expensive and common things to attend to when caring for the animal. Turtle Valley runs on a budget of approximately $350,000 a year and obtains most of their funding through grants, sponsors, admissions, and donations. The refuge encourages visitors to sponsor an animal to help out with some of the costs and are ideally looking for 20 sponsors per animal. Due to expensive veterinary bills and an increase in the price of hay due to a shortage, any donations are highly appreciated. The farm currently has 105 permanent resident donkeys to interact with which include 3 different sizes of donkey. The animals themselves are quite calm, friendly, and enjoy interacting with humans. The six staff members running the refuge offer tours and one-on-one time with the donkeys as well as information about individual donkey personalities and care. I dropped by the refuge to be energetically welcomed by the two founders, Shirley and Rob. Having never been within 10 feet of a donkey before, I really didn’t know what to expect from the animals. However, I was presently surprised. As Shirley educated us about the miniature donkeys, they would simply come up and bump into you looking for attention. It was quite adorable and I continued to pet and give my attention to several donkeys who were interested in what we were doing. The entire experience was quite peaceful as you look at the beautiful mountainous and green surroundings of Turtle Valley. For more information and directions to the refuge, check out their site at http://www.turtlevalleydonkeyrefuge.com. You can also get in touch with one of the founders Shirley Mainprize by sending an email or phone call to (250) 679-2778 and donkeyrefuge@gmail.com respectively.